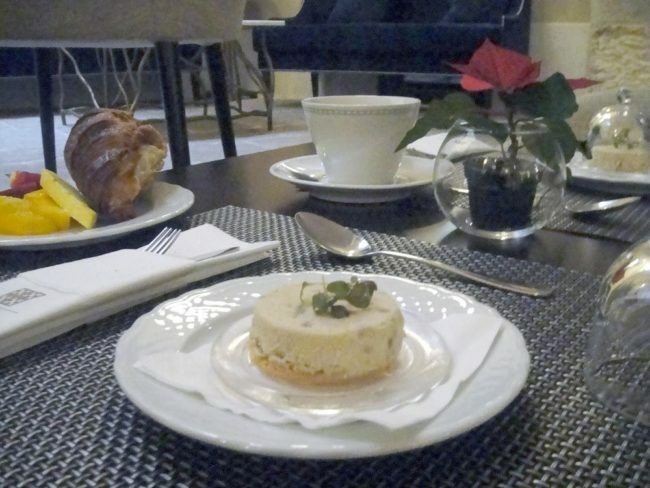 ​Driving into the heart of Lisbon city this past December, Love & Lavender couldn’t wait to arrive at Santiago de Alfama Hotel. 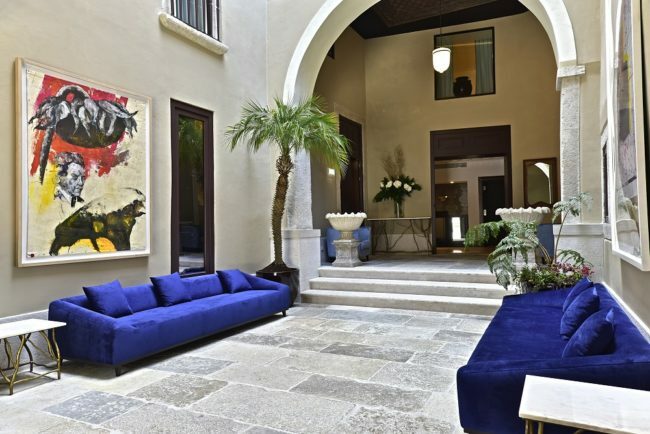 And for good reason, this 15th century Palacio dos Castros on the brink of ruin was lovingly restored and turned into a 21st century 5-star boutique gem. Motoring up the steep, narrow, one-way cobblestone street in our rented Fiat Punto was a bit nerve wracking to say the least. Then again, we’ve never backed down from an exciting wedding hotel review challenge. Arrive in the early afternoon and you may be as lucky as we were to find prime parking spot right near the hotel! A stay at an upscale European hotel during the Christmas season is always a treat. 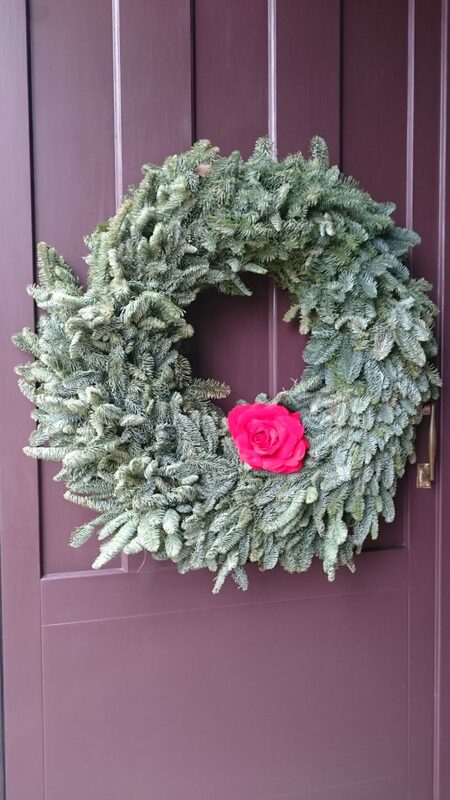 Not only were we warmly greeted by the reception staff who quickly offered a traditional welcome drink called Ginjinha, a lovely festive Christmas tree stood in the lobby and a big beautiful frosted wreath adorned the front door. Stepping down to a high ceiling reception area revealed a trendy boutique shop feeling reception area. Chocolate brown color shelving displayed all sorts of gourmet Portuguese products to buy as gifts to take home. After enjoying a welcome drink, we quickly inquired about where to park on a longer term basis. As it turns out, a few spots are available near the hotel, however a larger multi-story car park is located within a 5 minute walk from the hotel. The bellman promptly took our car keys to move the car to a free space right in front of the hotel. Lana, a lovely receptionist who speaks five languages fluently, gave a us a quick tour around the boutique hotel. The interior design of the hotel had a clear vision and purpose. 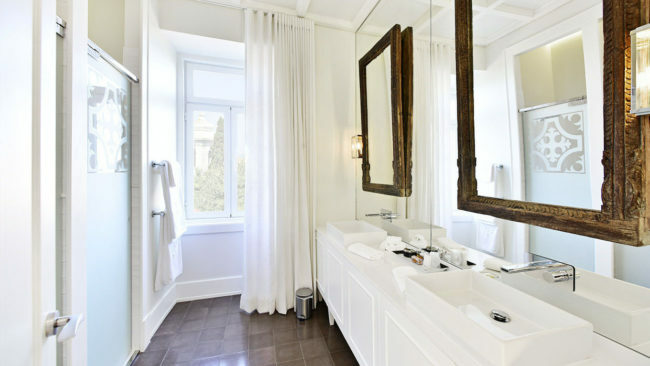 Each room has a clean white palette and a fresh feel, reminiscent of something straight out of Better Homes and Gardens magazine. The compact nature of the hotel makes it easy to navigate. 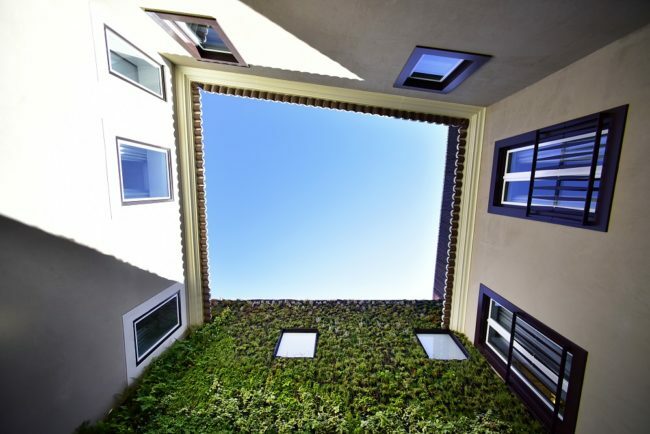 Each of the four floors offer a unique surprise around every corner – whether an open air courtyard complete with vertical living wall, ancient Roman ruin staircase found below the floor, or a common area balcony with impressive views of Alfama. The family owned and operated boutique hotel is well situated, complete with stunning views of old Alfama rooftops down towards the river. 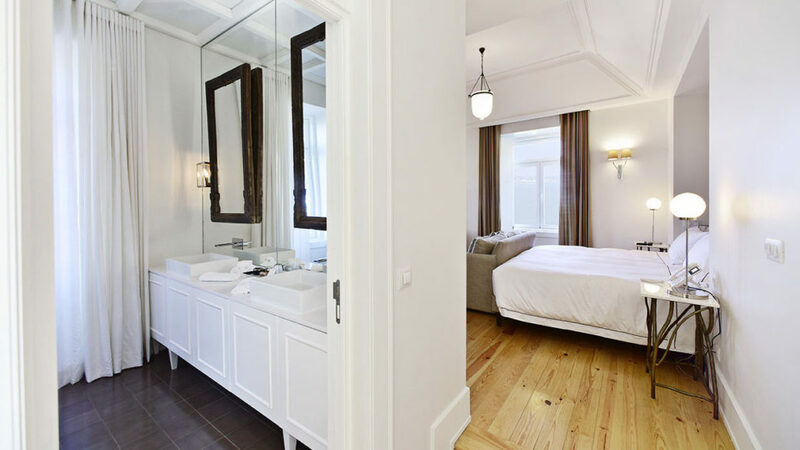 The hotel manages to capture the spirit of the old Alfama District through architectural character, highly polished Portuguese staff, and fresh, modern interior furnishings. At Santiago de Alfama, pride in what they have accomplished thus far is evident. 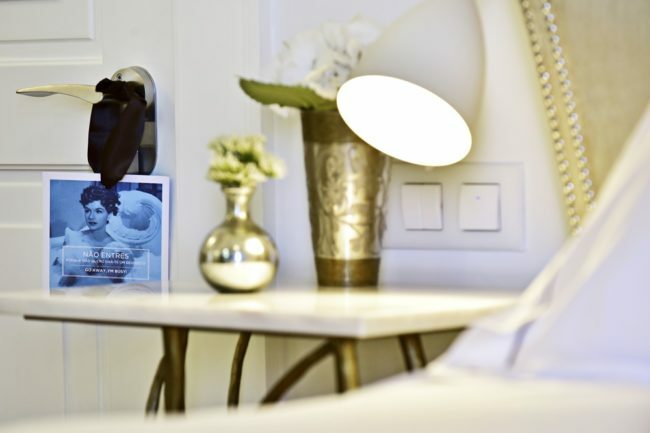 The hotel offers a very comfortable, enjoyable, and romantic (see next tab) space to hang your hat after a long day touring the streets of Lisboa. We wish we could’ve stayed a few more nights! 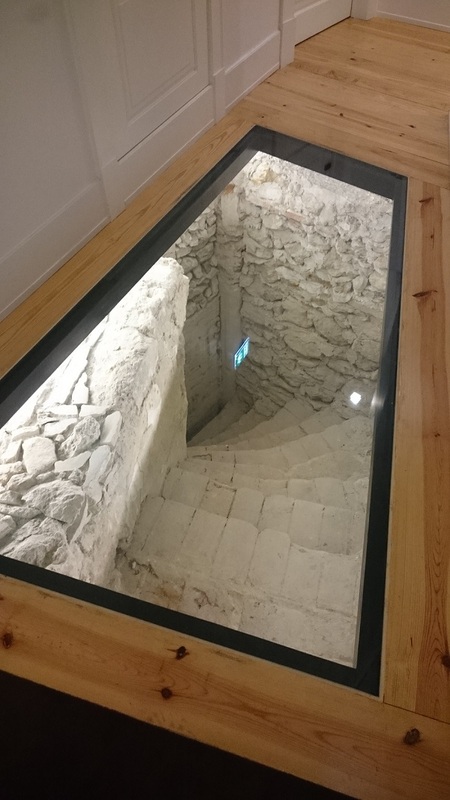 Palacio dos Castros (semi- translation “Royal Palace”) was on its way to becoming one of Lisbon’s archaeological heritage sites, until owner Heleen Uitenbroek swooped in to renovate and revive the property into Santiago de Alfalma. After finishing a finance degree and working for 10 years in London, New Zealand born Heleen decided to move to Alentejo, Portugal. She and her family bought a farm and raise goats & sheep, as well as harvest olives and cork. Known as ‘The Farm’ it could be a good day trip in the heart of Portugal to visit. 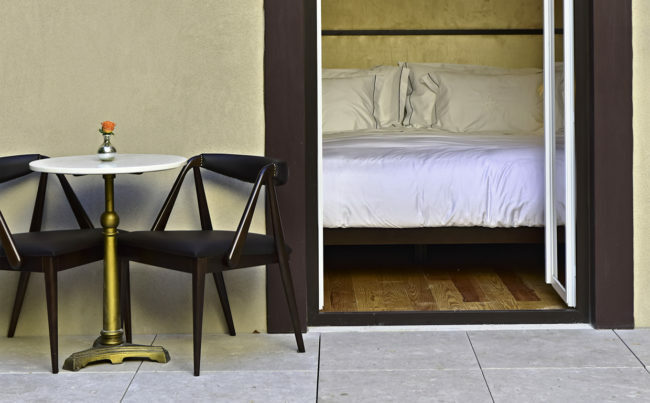 Heleen unexpectedly fell into the hotel business ​with the launch of her first boutique hotel in Lisbon called Chiado16. It was a #1 ranking boutique hotel on both Trip Advisor and Booking.com before it was sold in 2015. Now, she’s set her sights on turning Santiago ​de Alfalma into a world class hotel in a historical part of Lisbon. 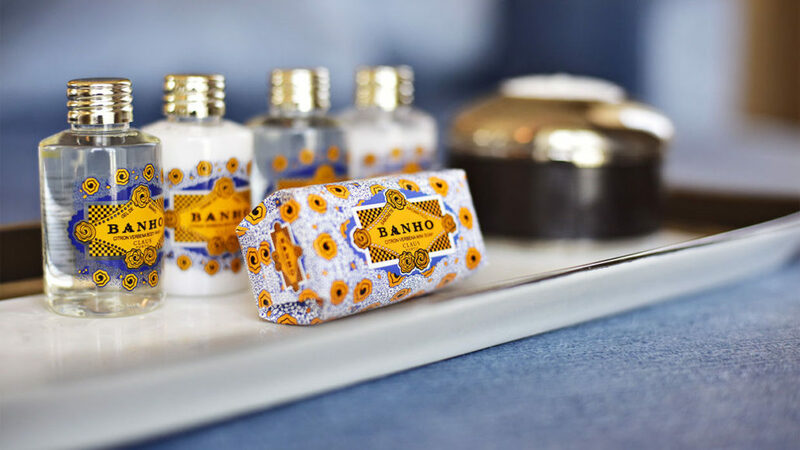 Six suites and thirteen bedrooms each offer high-speed internet, premium TV channels, hair dryer, in room safe, mini bar and complimentary toiletries by the 130 year old brand, Claus Porto. 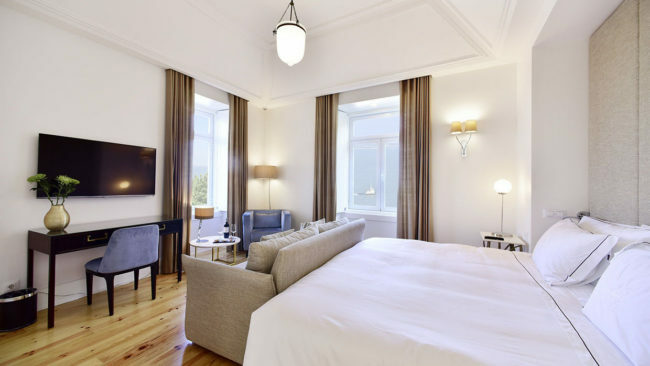 For honeymooners the hotel suggests booking the Santiago Suite, which offers panoramic views of both the Tejo River and the Alfama district. The Santiago Suite boasts a large bathroom with rain shower, freestanding bath in the bedroom, and amazing view. The suite has a wonderful lounge area with a beautiful view of the city. And, what honeymoon stay would be complete without a big, comfy, extra long king bed. 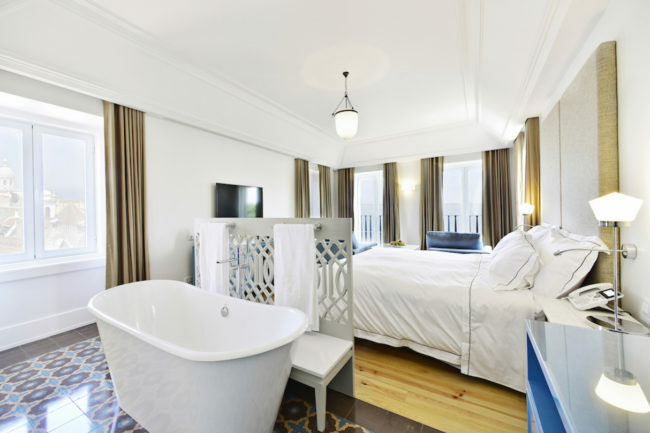 Our room was a junior corner suite boasting fantastic views overlooking the historic Alfama neighborhood and towards the river. My favorite parts of the room had to be the high vaulted stucco ceiling, great windows with natural light, the lovely hardwood floors, and a spacious bathroom (no tub though.) The room had a good sized couch at the end of the king size bed as a sitting area. 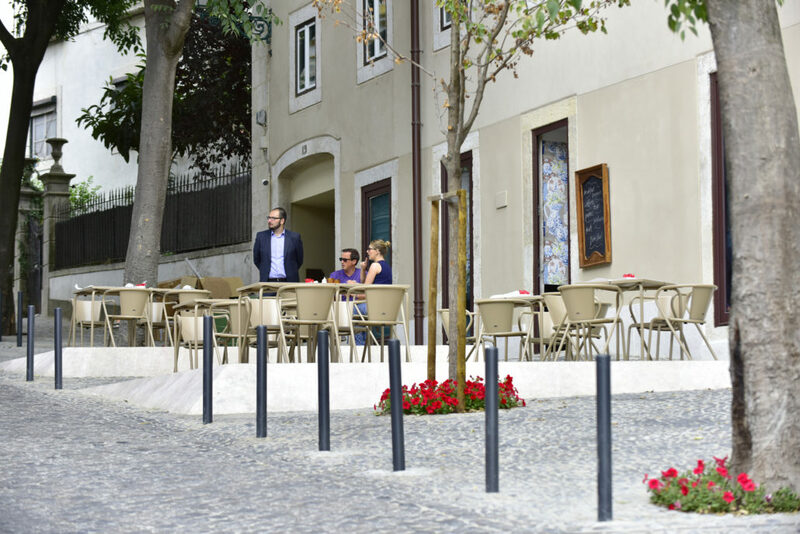 Santiago de Alfama has begun offering wedding packages for those who desire an intimate wedding reception in Lisbon city. 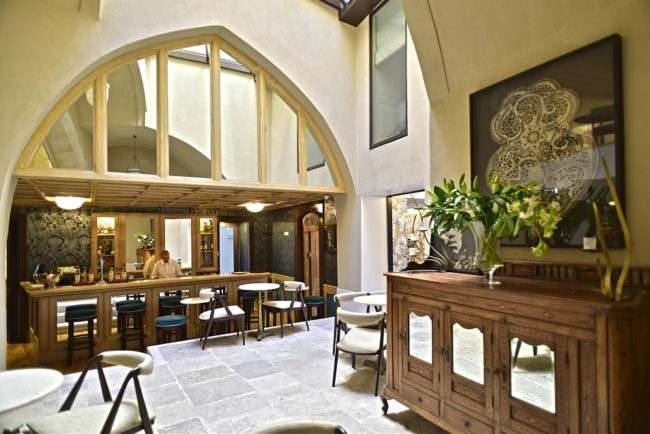 Either the indoor restaurant named ‘A Fabrica de Santiago,’ or the outdoor courtyard both make for beautiful wedding ceremony or reception settings for between 30 – 100 guests. Please contact the hotel for more information. Owner Helen borrowed the Santiago Cross and transformed it into a logo for her hotel. What a beautiful and brilliant idea! 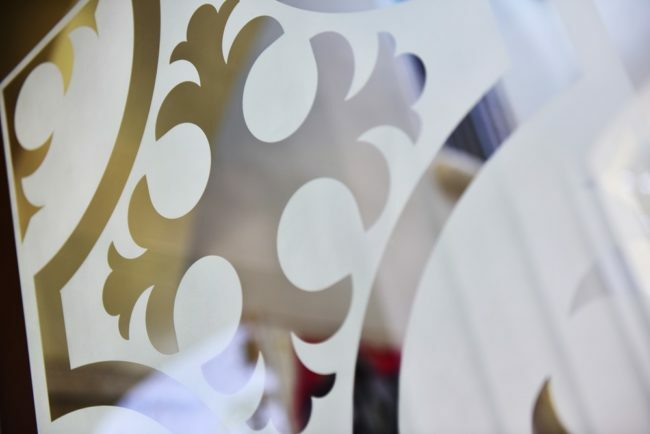 Santiago De Alfama’s logo is seamlessly placed throughout the entire hotel. Stumble upon it etched in glass, embroidered on crisp white pillowcases, or painted on tile floors. When renovating an old property in Lisbon, one is bound to find a few treasures hidden in attics, walls, or even the floor. 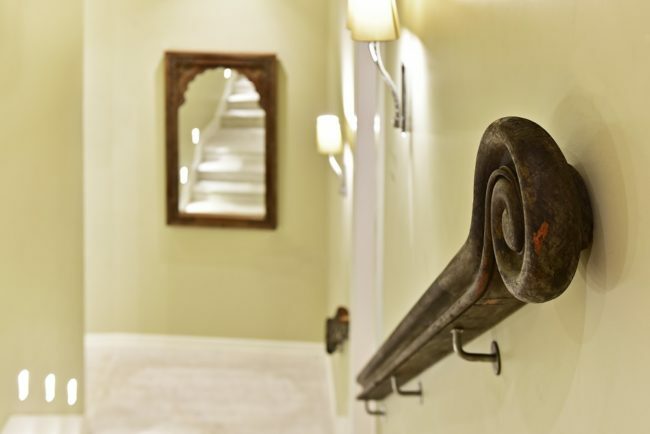 In Santiago de Alfama’s case, one hallway hosts an ancient staircase dating back to Roman antiquity. It is like nothing we have seen before, especially encased beneath a hotel. Walking on top is a little spooky, but Lana assured us it is perfectly safe and secure. 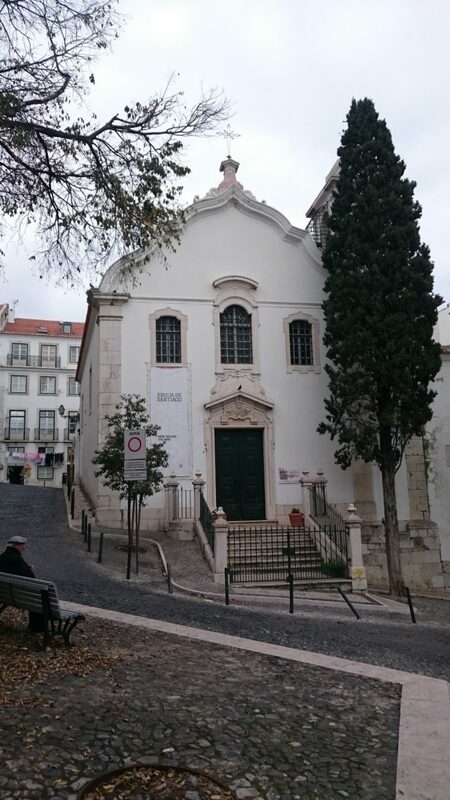 The church located adjacent to the hotel , Igreja de Santiago, is said to have been where Christopher Columbus married. Definitely an interested tidbit for a wedding blog such as ours! Sales and Marketing Director, Julie, told us that all the beautiful gold colored wooden side tables and other furniture was actually imported from India by the owner. What’s more, the pieces were all about to be thrown away – outrageous! One person’s junk is another lady’s treasure. Heleen had the furniture painted and then local marble placed on top. I absolutely love hearing stories about the provenance of items, especially when said items are up-cycled and created into something worthy of a chic furniture store display. 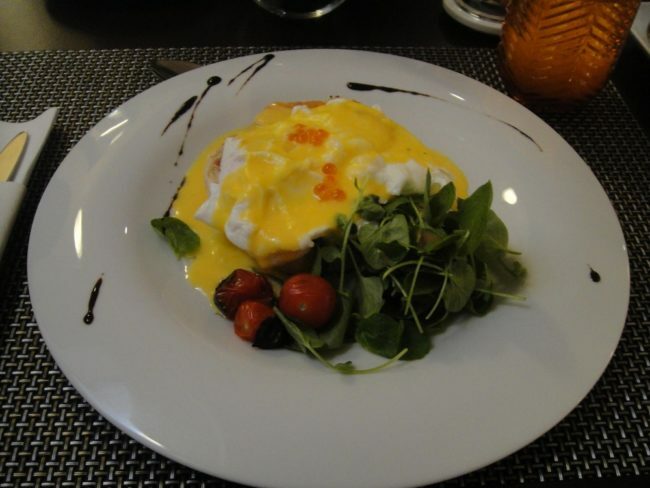 Our bed and breakfast rate meant we enjoyed a lovely morning meal at Fabrica de Santiago. Breakfast consisted of a large buffet filled with fresh fruit, cheese and meats, bakery goods, yogurt and cereal. In addition, an extensive breakfast menu provides additional tasty fare. Freshly squeezed juices and refillable coffee set us up for a great day! It happened to be Andrew’s birthday, and unbeknownst to us the staff somehow knew this fact. We were warmly greeted with a Happy Birthday wish for Andrew and each served a little delicious ice cream cake – a nice surprise. 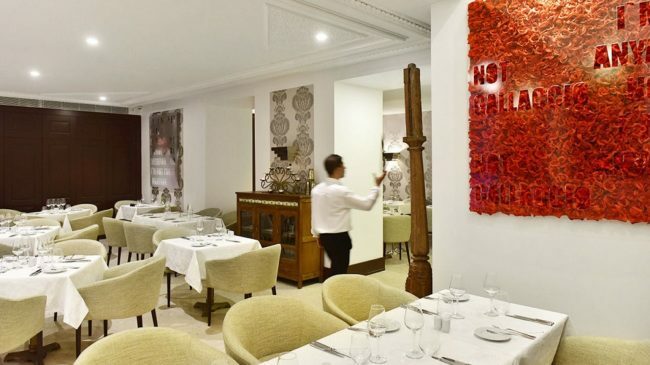 The restaurant serves a lunch and dinner menu that offers traditionally inspired Portuguese Cozinha. Chef Carlos Robalo creates seasonal menus with locally sourced produce. 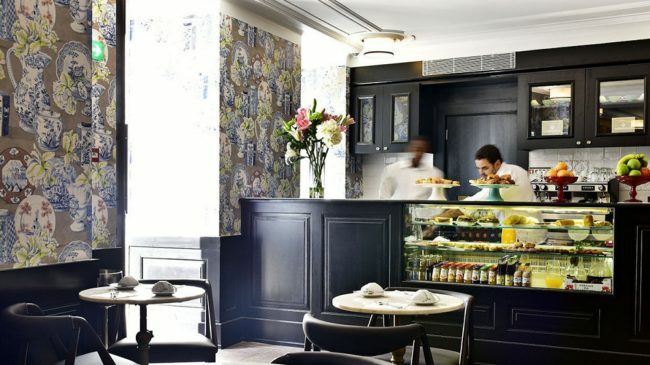 We stayed in winter, but it is said that the restaurant, café and bar spills out on to the esplanade in the warmer months to dine alfresco, enjoy afternoon tea or evening cocktails. 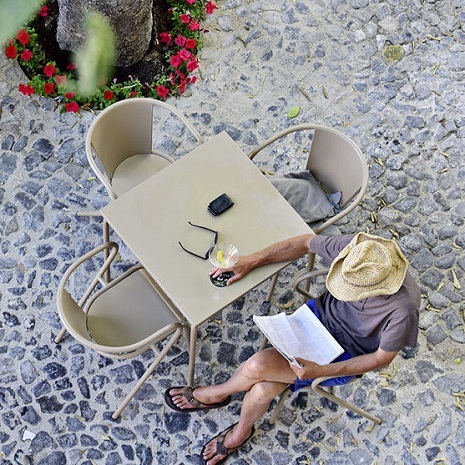 Relax, and enjoy the soothing sounds of fado or bossa nova that permeate the Alfama District. 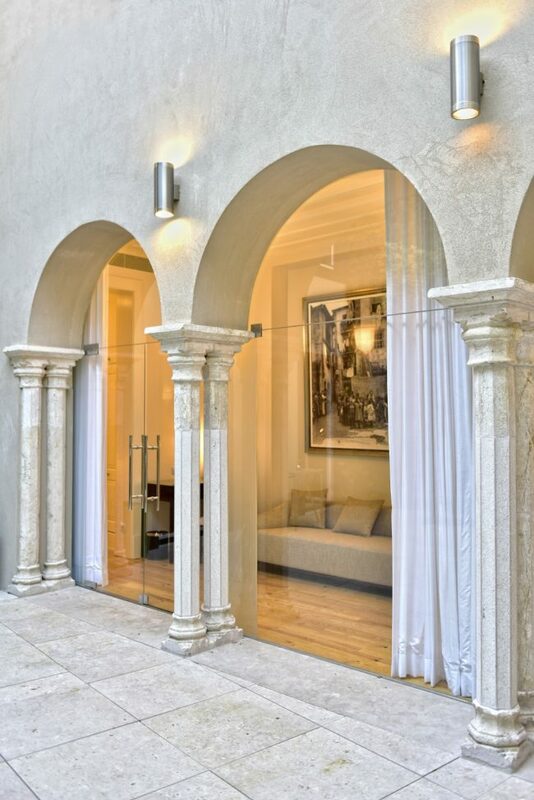 In need of a rejuvinating spa treatment after a tiring day of walking the cobblestone streets? You’re in luck, as the hotel has a spa and beauty salon called Madame Bollinger’s beauty bar located on the bottom floor. 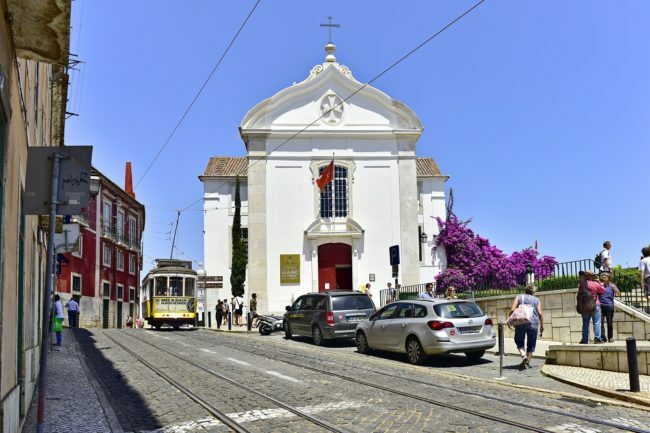 Hotel Santiago de Alfama is located on Rua de Santiago in the wonderfully nostalgic district of Alfama, immediately below Saint Georges Castle and above the famous view point, Miradouro de Santa Luzia. Alfama is Lisbon’s fado district, and this style of music is part of the fabric of the neighborhood, if you listen carefully you will hear the strum of a mandoline coming from an open window, or a fado singer coming down a cobbled street. 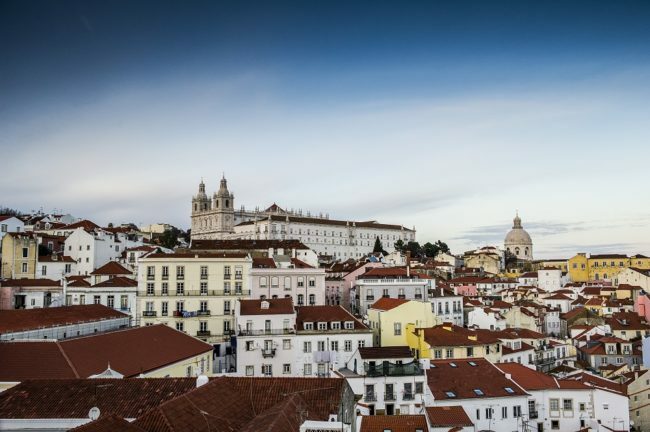 The Baixa area and Rua de Augusta and up to the Chiado district.